This year, on March 21, a few hundred women will come together for a fabulous evening of fundraising at the fourth annual Pink Power Party, hosted by and held at The Event Center @ iPA. The goals of this ladies’ night out are to have fun, be entertained, enjoy good company and celebrate one another, all while raising money to support Komen’s CSNJ’s mission of ending breast cancer forever. Among the celebration’s attendees will be Jackie Berman, a New Jersey native and Independent Associate for LegalShield/IDShield. Jackie is a longtime Komen CSNJ supporter and a continued member of the Pink Power Party planning committee since the event’s inception four years ago. Jackie first became involved with Komen CSNJ years ago after so many of her friends had been diagnosed with breast cancer. Jackie met Komen CSNJ’s Executive Director, Suzanne Corson, and learned about breast cancer and the purpose of Susan G. Komen. From then on, Jackie felt strongly about Komen’s mission to educate people about the many aspects and effects of breast cancer. Jackie has continuously shown her dedication to the organization by graciously donating her time, energy and fun spirit into helping Komen CSNJ further our vision of a world without breast cancer. This past November, Jackie was a top fundraiser for the 2018 MORE THAN PINK Walk. Now, she’s gearing up for the ultimate ladies night out — The 2019 Pink Power Party! Though it will be her fourth time at the Pink Power Party, Jackie will be experiencing the event from a different perspective this year. In 2018, Jackie was diagnosed with breast cancer, had undergone two lumpectomies and has recently finished radiation treatment. Jackie is now a breast cancer survivor. Jackie is not afraid to share her breast cancer journey, jokingly citing her “big mouth” as a resource to encourage other women to stay aware, informed, educated and checked. Like many women, Jackie never thought it was going to be her who developed breast cancer. Nobody in her family had been affected and she went every single year for her mammogram. Jackie was grateful she was going consistently to be checked, as the cancer was so deep down inside, she was informed she wouldn’t have felt her cancer until it was Stage 4. Thanks to the mammogram, Jackie’s cancer was found at Stage 2. Still, totally blown away by the diagnosis, Jackie was at a loss about what to do next. One of Jackie’s first calls when diagnosed was to Komen CSNJ. Jackie credits so much of her support to those at Komen CSNJ, who helped guide her through the steps to take next, the questions to ask her doctor, the financial information she needed to know and the emotional rollercoaster that comes with the diagnosis. The Komen organization plugged Jackie into all the resources she needed to get her through this difficult time. Jackie knew whenever she needed answers, Komen CSNJ was just a call away. Also alongside Jackie through her breast cancer journey was her son who’d flown out from Seattle to support, and her friends who drove her to the doctors and joined during appointments to take notes. 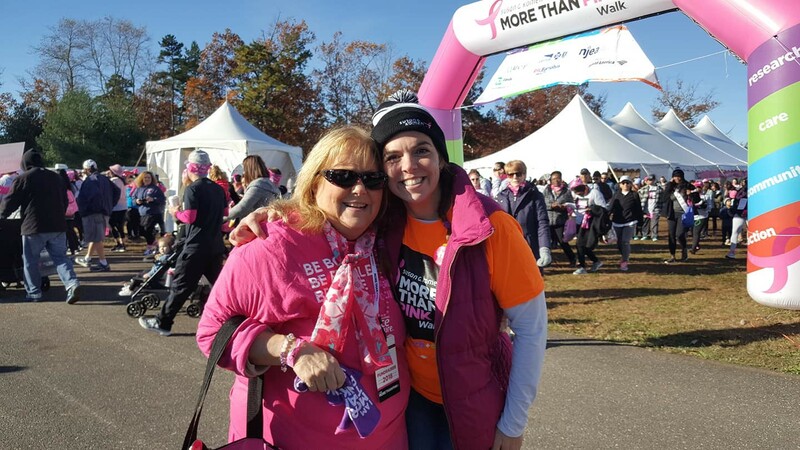 Now a survivor, Jackie feels her relationship with Komen CSNJ has evolved from being a volunteer to now becoming an even bigger spokesperson and advocate for breast cancer education. Since being diagnosed, Jackie has influenced her friends to get their annual mammograms and learn more about the disease. She wants others to realize how important education is when it comes to breast cancer, how genetics plays a role and what new treatments have been developed. “Knowledge is power,” Jackie stressed. Determined to end breast cancer once and for all, Komen CSNJ, Jackie, and the Pink Power Party committee have been working hard to make this year’s event even bigger and better than ever — and they’re looking to surpass the fundraising goal of $30,000. So many great vendors and sponsors in the community have joined in on the fun, selling out vendor tables and donating prizes for raffles, including a door prize of a set of diamond earrings from Gunther Publications. Jackie encourages people to come out with their families, friends and coworkers to celebrate women, celebrate survivors and forever fighters, and celebrate the Komen mission, all while having an amazing time, enjoying a fashion show styled by LOLA’s of Manalapan, shopping, food, cocktails and dancing! Jackie reflects in a message to those attending the ladies night. 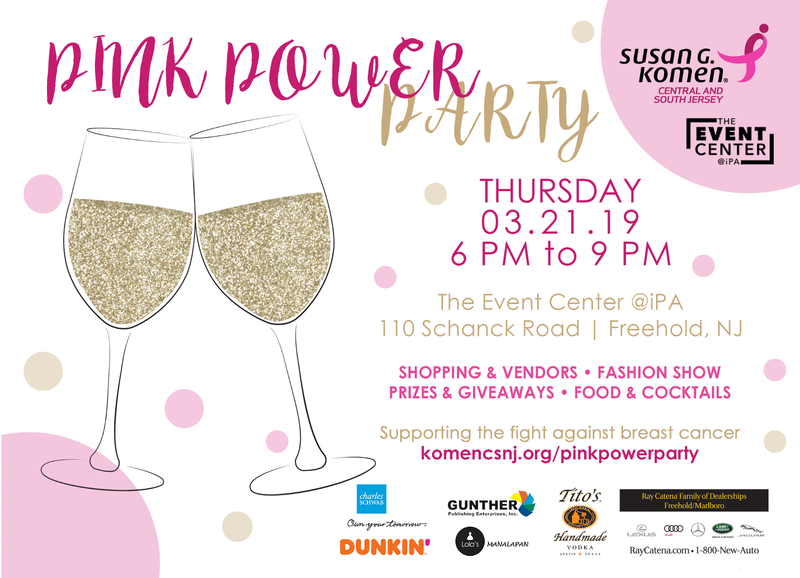 The Pink Power Party is supported by Ray Catena Lexus of Freehold, Tito’s Handmade Vodka, Dunkin’, Charles Schwab of Freehold — Rebecca Proske, and Gunther Publications. Join Jackie Berman at the Pink Power Party on Thursday, March 21 from 6PM–9PM at The Event Center @ iPA in Freehold, NJ. Purchase your tickets today: iplayamerica.com/pinkpowerparty.